Learner satisfaction survey is a questionnaire for your users to rate their learning experience. The survey helps you measure whether your learners are content with a course or not. 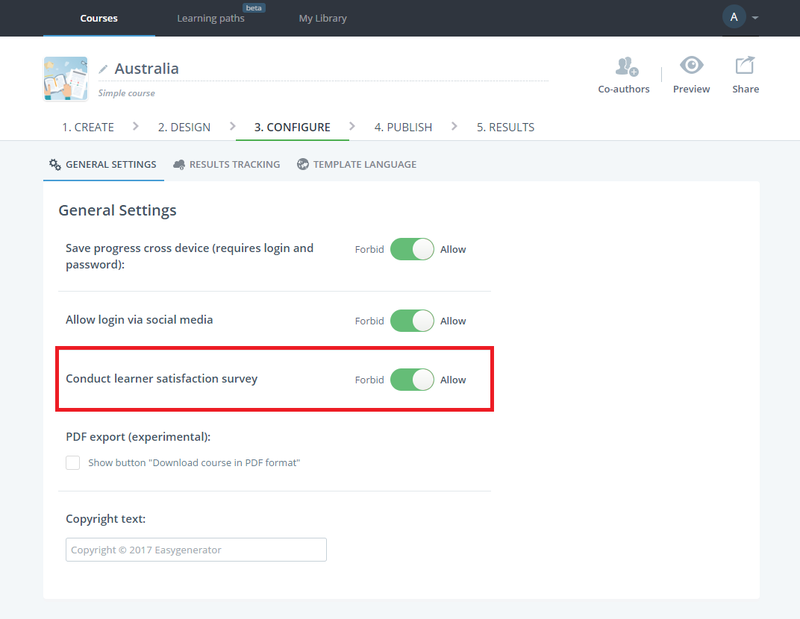 To enable learner satisfaction survey, you need to go to the Configure tab, General Settings section and enable Conduct learner satisfaction survey. After submitting results, learners will be able to respond to the survey on the overall experience of the course. Note: Make sure your learners are logged into a course. Otherwise, they won’t be able to take part in the survey. Learners’ feedback is sent to the Engagement section of the Results tab. With learner satisfaction survey, you can easily measure how people feel and what they think about your course.